Floriana is a Chartered Clinical Psychologist and an accredited Cognitive Behavioural Psychotherapist. She has over 16 years experience of working within Child and Adolescent Mental Health Services (CAMHS) and within the mainstream and specialist school settings as an independent practitioner. 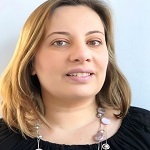 Floriana has a particular interest in working with parents and young people with Obsessive Compulsive Disorder, Anxiety Disorders, Trauma, challenging behaviours and Autism Spectrum Disorder. Floriana has been working using NVR since 2004 and in collaboration with colleagues has led the implementation of NVR within the South and East Kent CAMHS teams. She is currently developing NVR with staff and parents / carers within a specialist school and an ASD Unit in a mainstream school.